the shoulder straps would be very easy to do... the abdomen part would take longer. You pay 50 for saiyan saga vegeta and maybe another 50 to sculpt and then 15 for the small payment plus shipping it would be near the same price. not worth it in my opinion. I mean it can be done...I know of a way but it would be pretty expensive. Split the SS Vegeta torso, make a copy of it, then split the Saiyan Vegeta torso and take out all the internals and fit them inside the SS Vegeta Torso copy...then paint it all and seal it. Painting the armor and the blue suit to match the real parts would be tricky but possible. 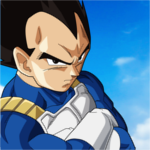 As for finding someone willing to split an SS Vegeta torso just to make copies...well...I'm the only one stupid enough to try it but even I don't want to do it. Then there's the matter of getting SS heads...I guess repainting the normal heads is an option but again it would be very tricky to match the quality. I'd say no because his proportions are really, really good. Why give him long, dorky legs or something to compensate for the problem of him being a different scale than Krillin? Hmmm...maybe not. I'd pop off the upper portion of the torso, extend the abs a little with epoxy putty and then put the upper portion onto the putty before it dries...chances are the slight movement in that area would be lost by the time the putty dried. I guess you could change it slightly and cut the ab piece in the middle (avoiding the hole where the chest peg goes into) and then place putty where you make the cut but I'm not sure if that would even work. hmmm thanks for the suggestion timone317 , is there a specific type of epoxy putty I should purchase? Better get something like PC Marine (for repairing fiberglass (plastic) like boats) that dries fairly quickly. I believe that type dries in 15 minutes. Keep in mind though that it's going to dry harder than plastic so removing it will be close to impossible. Also, you can prevent epoxy putty from sticking to something (to some extent) by putting a generous, yet even, layer of vaseline on the surface you don't want it to stick to. So if you were to split Trunks' body in half, you'd want to put the epoxy putty on one half, and on the other half put a enough vaseline that it's about half as thick as you'd spread peanut butter onto bread, and then put the parts together pretty precisely. The epoxy putty should bulge out of the area if you've pressed the body decently together, and you should use an x-acto knife or something else to cut the excess off and sculpt what you're wanting to sculpt. I recommended the PC Marine epoxy putty because the average repair epoxy putty has a working time between 2 to 8 minutes, which isn't enough time. Most plumbing and related epoxy putties are not meant to be sanded either. PC Marine is. 15 minutes should be enough, and that's how long it takes to cure. If Trunks coming apart at the waist or whatever is important to you, you should make the peg hole a lot larger than necessary, and let the epoxy putty dry without the other part of the body connected. So go through the process above, but use two times as much vaseline on the part of the body you want to remove, and let the epoxy putty harden. Wipe some of the excess vaseline off the other part, but not all of it. Then, you squirt hot glue in the hole you left and make sure you have a VERY THIN layer of vaseline on the peg and anything else that will end up touching the hot glue, and insert it into the hot glue. Hot glue is not very strong, so you will need to have extremely good coverage on anything it touches otherwise when you try twisting the body or whatever, the glue might stick to a small part you didn't cover, and it'll rip the glue. Hot glue has enough flexibility to allow you to make something removable though and is how I do almost every single neck joint I make when I use a different head. help veteran customizers! 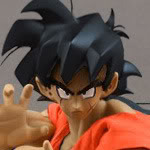 as majority of you guys know, im just a rookie at customizing, im in the process of making a turles figure using irwin raditz and irwin goku head. whats the best way to drill a hole on the face for me to put a scouter (irwin round scouter not the thin scouter from jakks series) in? Use a very tiny drill bit . A lot of the semi professionals use Dremels. looks like thats what ill do, just gotta find a really small one i guess. You should be able to get one at any hardware store I think. Even hobby places have the tiny drill bits sometimes. Just a drill. Your average Black & Decker or whatever drill bit set will have the size you need. No need for a dremel as dremels are for high speed processes, and you wouldn't want to try to drill a hole at high speed. just snaged a cheap jakks radditz doll. im thinking of using him as a base for a king vegeta. anyone know what's a good head to use for him? thanks!!! I'd say a Jakks Vegeta head because it would be a simple swap but then you have to decide on the method of applying the goatee.